Item # 307164 Stash Points: 1,095 (?) This is the number of points you get in The Zumiez Stash for purchasing this item. Stash points are redeemable for exclusive rewards only available to Zumiez Stash members. To redeem your points check out the rewards catalog on thestash.zumiez.com. Sweat it out in signature Champion style, thanks to the Black & White Stripe Wristbands. This two pack of soft cotton terry constructed wristbands offer tons of stretch for a custom fit. 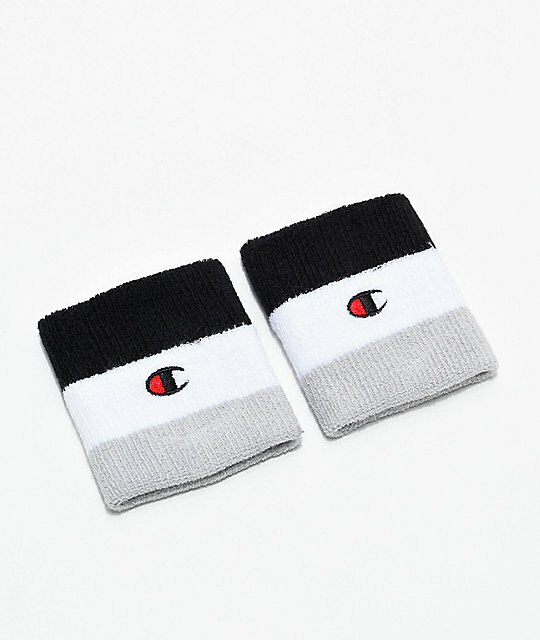 Highlighted by an embroidered Champion "C " logo and coming in a black, white and grey colorway, these sweatbands will pair well with all of your athletic looks. Black & White Stripe Wristbands from Champion. Soft terry cotton band with plenty of stretch for a custom fit. Black, white & grey striped design.